¶ All tracks composed by War (Papa Dee Allen, Harold Brown, B.B. Dickerson, Lonnie Jordan, Charles Miller, Lee Oskar, Howard E. Scott). ¶ Remastered and expanded edition with four unreleased “ghetto jams” – all from the original tapes provided by co-producer Jerry Goldstein. ¶ War‘s third album as an act separate from Eric Burdon was also far and away their most popular, the group’s only long-player to top the pop charts. ¶ “The Cisco Kid” and “The World Is a Ghetto” understandably dominated the album’s exposure, but there’s much more to enjoy here, even decades on. Beyond the quality of the musicianship, the classy, forward-looking production has held up remarkably well, and not just on the most famous cuts here; indeed, The World Is a Ghetto is of a piece with Marvin Gaye’s What’s Going On and Curtis Mayfield’s Curtis, utilizing the most sophisticated studio techniques of the era. Not only does it sound great, but there are important touches such as the phasing in “Four Cornered Room,” not only on the percussion but also on the vocals, guitars, and other instruments, and the overall effect is a seemingly contradictory (yet eminently workable) shimmering blues, even working in a mournful and unadorned harmonica amid the more complex sounds. 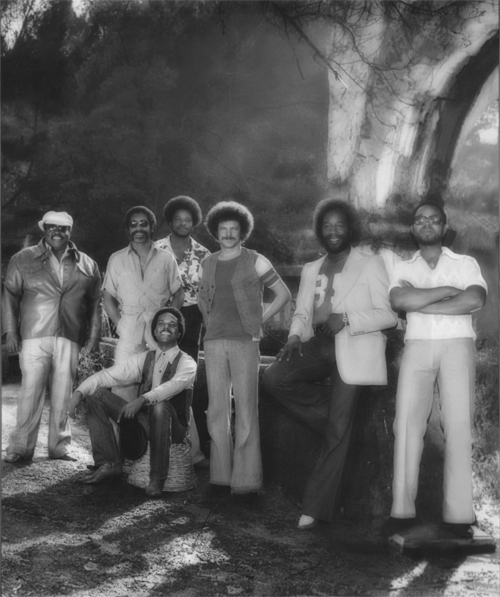 ¶ One of the most popular funk groups of the '70s, War were also one of the most eclectic, freely melding soul, Latin, jazz, blues, reggae, and rock influences into an effortlessly funky whole. Although War's lyrics were sometimes political in nature (in keeping with their racially integrated lineup), their music almost always had a sunny, laid-back vibe emblematic of their Southern California roots. War kept the groove loose, and they were given over to extended jamming -- in fact, many of their studio songs were edited together out of longer improvisations. Even if the jams sometimes got indulgent, they demonstrated War's truly group-minded approach: no one soloist or vocalist really stood above the others (even though all were clearly talented), and their grooving interplay placed War in the top echelon of funk ensembles. ¶ The roots of War lay in an R&B cover band called the Creators. Guitarist Howard Scott and drummer Harold Brown started the group in 1962 while attending high school in the Compton area, and three years later, the lineup also featured keyboardist Leroy "Lonnie" Jordan, bassist Morris "B.B." Dickerson, and saxophonist/flutist Charles Miller (all of them sang). The group had an appetite for different sounds right from the start, ranging from R&B to blues to the Latin music they'd absorbed while growing up in the racially mixed ghettos of Los Angeles. Despite a two-year hiatus following Scott's induction into the service, they released several singles locally on Dore Records (their first, "Burn Baby Burn," was with singer Johnny Hamilton), and backed jazz saxophonist Jay Contreli, formerly of the psychedelic band Love; they also went by the names the Romeos and Señor Soul during this period. In 1968, the band was reconfigured and dubbed Nightshift; Peter Rosen was the new bassist, and percussionist Thomas Sylvester "Papa Dee" Allen, who'd previously played with Dizzy Gillespie, came onboard, along with two more horn players. B.B. Dickerson later returned when Rosen died of a drug overdose. In 1969, Nightshift began backing football star Deacon Jones (a defensive end for the L.A. Rams) during his singing performances in a small club, where they were discovered by producer Jerry Goldstein. ¶ Goldstein suggested the band as possible collaborators to former Animals lead singer Eric Burdon, who along with Danish-born harmonica player Lee Oskar (born Oskar Levetin Hansen) had been searching L.A. clubs for a new act. ¶ After witnessing Nightshift in concert, Burdon took charge of the group. He gave them a provocative new name, War, and replaced the two extra horn players with Oskar. To develop material, War began playing marathon concert jams over which Burdon would free-associate lyrics. In August 1969, Burdon and War entered the studio for the first time, and after some more touring, they recorded their first album, 1970's Eric Burdon Declares War. The spaced-out daydream of "Spill the Wine" was a smash hit, climbing to number three and establishing the group in the public eye. A second album, The Black Man's Burdon, was released before the year's end, and over the course of two records it documented the group's increasingly long improvisations (as well as Burdon's growing tendency to ramble). It also featured War's first recorded vocal effort on "They Can't Take Away Our Music." Burdon's contract allowed War to be signed separately, and they soon inked a deal with United Artists, intending to record on their own as well as maintaining their partnership with Burdon. However, Burdon -- citing exhaustion -- suddenly quit during the middle of the group's European tour in 1971, spelling the beginning of the end; he rejoined War for a final U.S. tour and then left for good. ¶ War had already issued their self-titled, Burdon-less debut at the beginning of 1971, but it flopped. Before the year was out, they recorded another effort, All Day Music, which spawned their first Top 40 hits in "All Day Music" and "Slippin' Into Darkness"; the album itself was a million-selling Top 20 hit. War really hit their stride on the follow-up album, 1972's The World Is a Ghetto; boosted by a sense of multicultural harmony, it topped the charts and sold over three million copies, making it the best-selling album of 1973. It also produced two Top Ten smashes in "The Cisco Kid" (which earned them a fervent following in the Latino community) and the title ballad. 1973's Deliver the Word was another million-selling hit, reaching the Top Ten and producing the Top Ten single "Gypsy Man" and another hit in "Me and Baby Brother." However, it had less of the urban grit that War prided themselves on; while taking some time to craft new material and rethink their direction, War consolidated their success with the double concert LP War Live, recorded over four nights in Chicago during 1974. ¶ Released in 1975, Why Can't We Be Friends returned to the sound of The World Is a Ghetto with considerable success. The bright, anthemic title track hit the Top Ten, as did "Low Rider," an irresistible slice of Latin funk that became the group's first (and only) R&B chart-topper, and still stands as their best-known tune. 1976 brought the release of a greatest-hits package featuring the new song "Summer," which actually turned out to be War's final Top Ten pop hit; the same year, Oskar released his first solo album, backed by members of Santana. A double-LP compilation of jams and instrumentals appeared on the Blue Note jazz label in 1977, under the title Platinum Jazz; it quickly became one of the best-selling albums in Blue Note history, and produced an R&B-chart smash with an edited version of "L.A. Sunshine." ¶ Yet disco was beginning to threaten the gritty, socially aware funk War specialized in. ¶ Later in 1977, the band switched labels, moving to MCA for Galaxy; though it sold respectably, and the disco-tinged title track was a hit on the R&B charts, it fizzled on the pop side, and proved to be the last time War would hit the Top 40. After completing the Youngblood soundtrack album in 1978, the original War lineup began to disintegrate. Dickerson left during the recording of 1979's The Music Band (which featured new female vocalist Alice Tweed Smith), and not long after, Charles Miller was murdered in a robbery attempt. After The Music Band was released, the remaining members attempted to refashion their image to fit the glitz of the era, and added some new personnel: bassist Luther Rabb, percussionist Ronnie Hammon, and saxophonist Pat Rizzo (ex-Sly & the Family Stone). The Music Band 2 flopped, and the group was thrown into disarray; Smith exited, and the follow-up took an uncharacteristic three years to prepare. Released in 1982, Outlaw was a moderate success; the title track was a Top 20 R&B hit, and "Cinco de Mayo" became a Latino holiday standard. Yet it didn't restore War's commercial standing. Rizzo left later in the year; Harold Brown followed in 1983, after Life Is So Strange flopped; and Rabb was replaced with Ricky Green in 1984. In the years that followed, War was essentially a touring outfit and nothing more. Papa Dee Allen collapsed and died on-stage of a brain aneurysm in 1988, leaving Jordan, Hammon, Oskar, and Scott as the core membership (Oskar would finally leave in 1992). Interest in War's classic material remained steady, however, thanks to frequent sampling of their grooves by hip-hop artists. 1992's Rap Declares War paired the band with a variety of rappers, paving the way for the 1994 comeback attempt Peace Sign; for that record, Brown returned on drums, and Jordan (now on bass), Scott, and Hammon were joined by saxophonists Kerry Campbell and Charles Green, percussionist Sal Rodriguez, harmonica player Tetsuya "Tex" Nakamura, and Brown's son, programmer Rae Valentine (plus guests Lee Oskar and José Feliciano). The album failed to chart, however, and the group returned to the touring circuit. Brown and Scott left the lineup in 1997. Aliases: Eric Victor Burdon /// ¶ As the lead singer of the Animals, Eric Burdon was one of the British Invasion's most distinctive vocalists, with a searingly powerful blues-rock voice. When the first lineup of the group fell apart in 1966, Burdon kept the Animals' name going with various players for a few years. Usually billed as Eric Burdon & the Animals, the group was essentially Burdon's vehicle, which he used to purvey a far more psychedelic and less R&B-oriented vision. Occasionally he came up with a good second-division psychedelic hit, like "Sky Pilot"; more often, the music was indulgent, dating almost immediately. Burdon's real triumphs as a solo artist came at the beginning of the '70s, when he hooked up with a bunch of L.A. journeyman soul/funksters who became his backing band, War. Recording three albums' worth of material in the year or two that they were together, the Burdon/War records could ramble on interminably, and would have benefited from a lot of editing. But they contained some spacy funkadelia of real quality, especially their number three hit single "Spill the Wine," which was almost recorded as an afterthought in the midst of sessions dominated by exploratory jams. Eric Burdon & War were already big stars on record and stage when Burdon, for reasons unclear to almost everyone, quit the band in 1971. War defied expectations and became even bigger when left to their own devices; Burdon, after recording an album with veteran bluesman Jimmy Witherspoon, cut a series of generally desultory solo albums. He recorded off and on after that, at times with the Animals, but has never come close to reaching the heights of his work with the early Animals and War. ¶ Burdon was always a riveting live performer, though, and he continued to tour into the 21st century with various incarnations of the Animals and as a solo act, branching out as a painter and author as well, and working in the studio when it suited him. ¶ Lee Oskar who has been described as "a virtuoso," "the harmonica whiz" "a war hero," "legendary," "musical wizardry," and as "generally regarded to be among the best rock-blues-soul harmonica players." His role as a founding member and former lead harmonica player of the pioneer funk-jazz group War won him international renown for over two and a half decades (1969–1993). Oskar's signature solos helped to define the War sound from the band's beginning in 1969, adding dashes of color to its R&B, jazz, rock, and Latin influences. Oskar's position with War was a prominent one from its early days with singer Eric Burdon onward. "My playing has become more aggressive over the years", he says. "In the beginning, my role was playing horn lines. Today, it's evolved to the point where I'm playing a lead instrument. If I'm not doing a solo, I'm playing counterlines—I try to paint within certain spaces in the music to help create the overall picture." ¶ The eclectic, multicultural nature of War's music is also evident in Oskar's solo projects. Three well regarded albums released between 1976 and 1981 (and recently rereleased on CD) brought critical and popular acclaim including being voted No. 1 Instrumental Artist of the Year for 1976 in not one, but three major industry mags: Billboard, Cashbox and Record World. The albums, like Oskar's live performances, show the diverse influences of his musicality. A composer, his compositions have been featured on movie sound tracks and television commercials. He has been the recipient of many Gold and Platinum recordings and honored with special ASCAP Writing Awards. ¶ In 1983 Oskar formed a company to manufacture high-quality harmonicas. His company, Lee Oskar Harmonica, sells harmonicas suited to many different styles of music, including blues, folk, rock, R&B and country. The harmonicas themselves are manufactured by Tombo. Oskar's harmonica company celebrated its 25th anniversary in 2008 at the NAMM Show (Oskar playing one of his harmonicas at the 2008 NAMM Show).